Barter Books : Bobinski, Kazimierz; Zamoyski, Stefan : Family Table of Racehorses [with] Addenda for 1960 - 1969. Two volume set. Green varnished soft cloth cover with gilt titles and green paper covers for the Addenda. Green slipcase and carrying case. G : in good condition without dust jacket with carrying case for Volume I and slipcase for Volume II. Slipcase rubbed. Carry case with bumped edges and some rubbing. Minor rubbing to top and tail of spine of Volume II. Minor spotting to addenda. 1953-1959 Blodstock history printed in English-Polish-French-Spanish-German language. 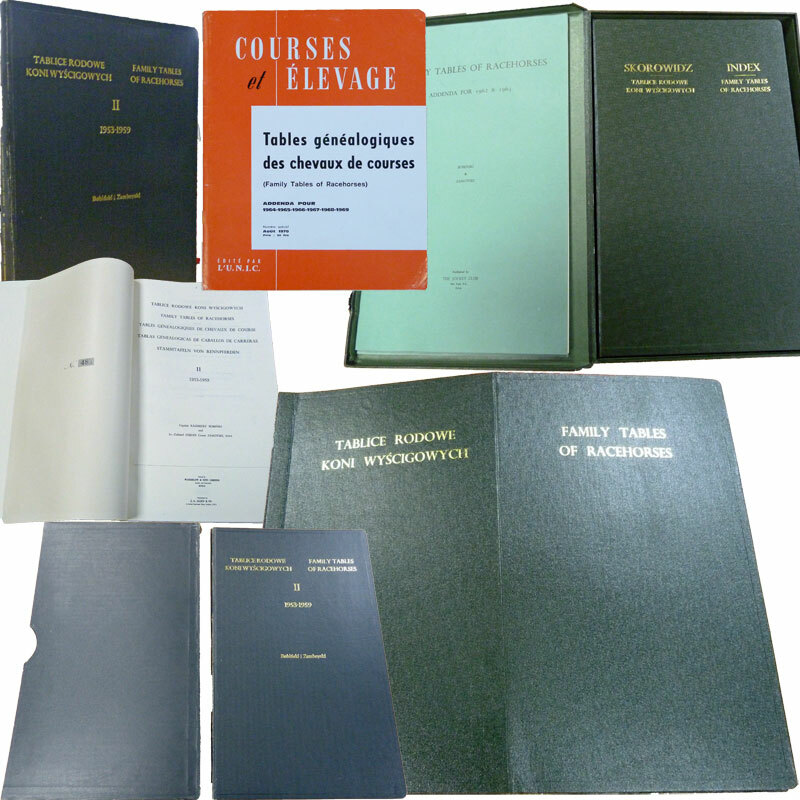 These volumes cover the genealogical history of over 50,000 racehorses from the 18th century to the mid 20th century. Volume I is a fold-out double page directory charting the history of each stud. The 'Bobinski Tables' form the cornerstone of any thoroughbred pedigree research library. Historically, 'The Family Tables of English Thoroughbred Stock', published in German in 1885 by Herman Goos, were followed by Lowe who was only able to identified 43 families; Goos had identified 61. Goos’s book was republished in 1897, with 50 family charts, but now using Lowe’s system of numbering families, with family number 1 being the foundation mare to whom the most classic winners traced in tail-female descent. Goos’s genealogical charts set the model for a number of later publications, the most significant and comprehensive being by Bobinski and Zamoyski. 'The Bobinski Tables', identified a total of 74 families tracing mares, the first 49 of which were based on Lowe and Goos, and subdivided the families alphabetically, as in "1-a," to denote various significant branches. In addition, they expanded research into female families of racehorses including Polish (P), Argentine (Ar), American (A), and Colonial (C)-Australian and New Zealand-female lines, and half-bred families (HB). The second, updated volume of the Bobinski Tables was then issued in 1963. The system of identifying female lines by Lowe family number persists to this day. The increasing sophistication of commercial pedigree databases now available to the general public, breed historians, pedigree fans, and bloodstock consultants means that anyone interested in the heritage of throughbreed horses will consider deep analysis of family numbers useful in planning matings and checking form. Published: 1953-1964; 1964-1969.